How can I disable Control Key + F7 which brings up System Report in Acronis 2015. I need to use this combination in another program which I use all day every day. Unfortunately it is impossible at the moment to manage the shortcuts for Acronis True Image. Your request has been registered as TI-23686 and will be reported to the program and UX managers. THIS IS INFURIATING..... IT MAKE ACRONIS 2015 UNUSABLE FOR ME. You keep "improving" your software actully making it worse. You can edit its shortcut properties in start menu - programs->acronis->tools->system report and remove the hotkey. I vote for this, too. I'm using CTRL+F7 in another application, and I DON'T WANT Acronis to pop up each time I press that shortcut. I'm a software programmer, and as such I can assert this is a huge mistake. You simply CAN'T lock up a user's keyboard for your needs. At least let the user choose or disable it. I'm very disappointed. 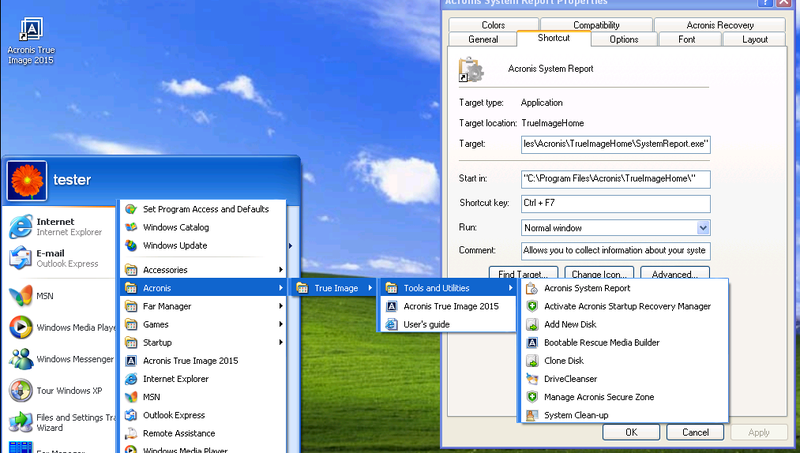 @Fedor: thanks, but there's nothing like acronis->tools->system report in Acronis 2015. No way to remove that silly hotkey ATM, unless Acronis fixes their software. I searched for that everywhere... except the most obvious place lol. Fedor you rock. Many thanks. Honestly I haven't tried yet. But it looks reasonable. I will try tomorrow and post my results. Thanks. But having installed Version 15 and then gone back, i am not sure I will try 15 again. I can confirm that this worked for me with Acronis 2015. Thanks.... even so I wasted a lot of time on this. I have Windows 10 Preview, and since there are no shortcuts installed in the start menu (just the one link to Acronis True Image 2015), I have no way to disable this shortcut. Then you will see the System Report shortcut. Either; 1. delete the shortcut-key (by editing the properties), or 2. just delete the shortcut itself. ...what a waste of time. Please don't leave this as a default behaviour of an otherwise excellent piece of software (an installation option would suffice... or default it to "off"). I also removed the shortcut using Greg's advice (I'm on Windows 8.1). Thanks ! Message to Acronis: if you don't know it yet, Ctrl-F7 is the default shortcut for running compiler in Microsoft Visual Studio. I'm glad to let you know that we released an article which contains a step-by-step guide on how to change default shortcut key (Ctrl+F7) for Acronis System Report. If you want to set a custom shortcut key please follow this instruction. The solution posted by Fedor Larin on 2011-10-13 worked just fine. Thank you Fedor. I do, however, want to line up with all those who found this hijacking of our systems by Acronis without our knowledge and consent to be completely unacceptable. Completely agree with the angries, Acronis just made its product a nightmare. User experience is not about flat icons, but usability. I got mad until figuring out how to deselect this completely unuseful shortcut. Why did Acronis think we should create system reports ten times a day? Do they know what poor True Image is? Or why do we get a shortcut for a very rare function? It is not enough that backing up to local network does not work reliably, the cloud is inaccessible for the most of the time, and scheduled backups fail to wake up the computer so I'm stuck with backups being created when I should work, I get idiotic keyboard shortcuts... Closer and closer to switch to another product. I am puzzled. When I tried to solve the Ctrl-F7 hotkey problem on true image 2016, the system report icon said it's hotkey is ctrl-F11. I removed it anyway but ctrl-F7 still brings up the acronis system report. Is there something else I need to change? P.S. I just rebooted and so far the ctrl-F7 problem has gone away. Don't know what happened here (did not make any changes but upgraded to the 2016 version), but I got rid of this nightmare shortcut. I hope it will never come back. no i will use ACRONIS again. it did maked id unuseful for me first.